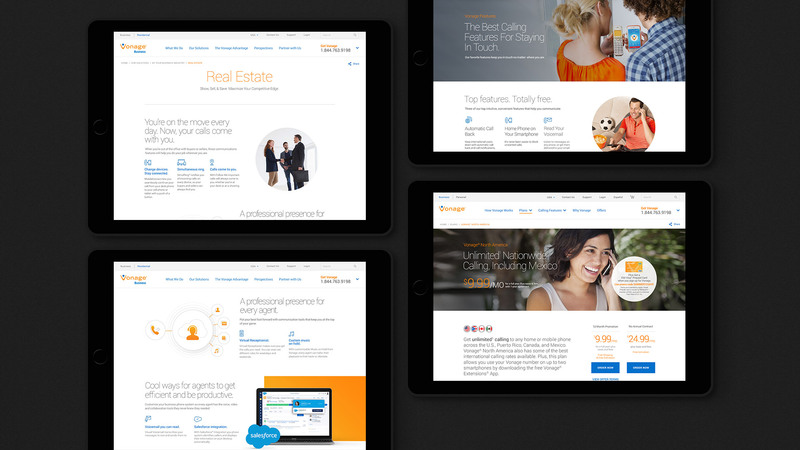 Reimagining Vonage’s entire digital customer experience, from generating demand to optimizing conversion. How do you communicate complex product offerings to unique audiences from one master brand? 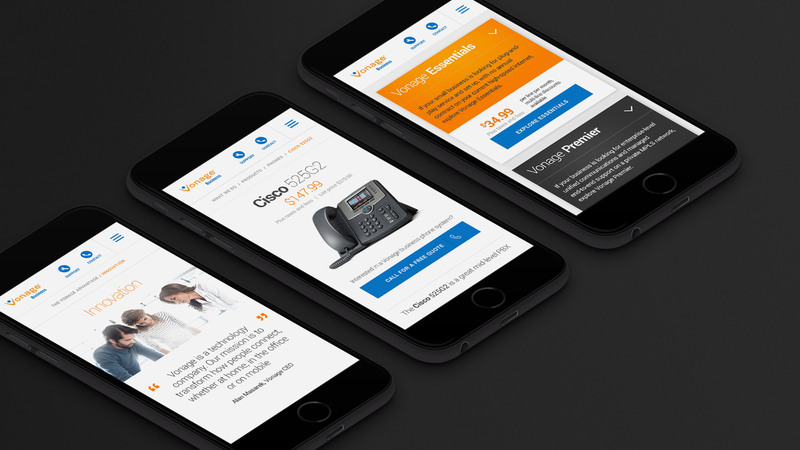 Digital Refresh: We created a simple, human and modern aesthetic that matched the sophistication of Vonage’s business offerings and elevated their digital presence across desktop and mobile. New Look & Feel: Using simple lines and bold color, we created illustrations that helped contextualize the benefit of their more complex offerings, and built an icon library that helped users maneuver through the site easily. Translating Tone of Voice: Leveraging their core brand voice, we created a manner of speaking for digital that was fun, concise and benefit-driven to convey the essential information about their offerings in ways most relevant to their audience. Unified Brand Identity: We created subtle variation to differentiate their residential and business websites while maintaining a cohesive look and feel. Templated Approach: We built a page hierarchy that naturally drives users toward conversion as they explore the site and learn about the offerings. Nimble Architecture: As an innovative company, they needed a website that could expand with their business. Using a modular structure we created a format that could easily adapt. Purpose-Built User Journeys: We created transparent logic for how their audiences would move through the site, and created multiple funnels to lead generation based on their business needs, sizes and industries. 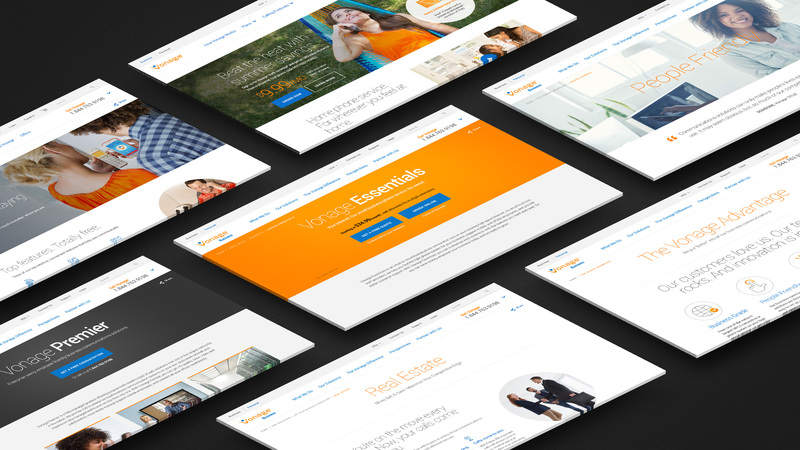 Thought Leadership Platform: We built an intuitive content hub that gave Vonage a space to build on their relationships with their customers while strengthening their presence as a thought leader in the industry. 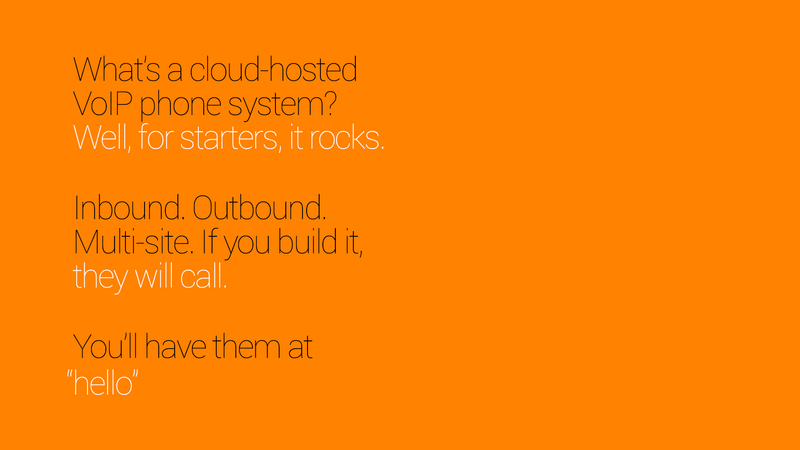 Vonage had shifted from being a consumer-focused, home phone and long distance company to offering business-first cloud communications services. With this pivot came growing pains. After acquiring twelve businesses last year, the Vonage product portfolio had ballooned into forty different product offerings, with three diverse audiences (consumer, small business & enterprise) under one master brand. As such, they needed a digital partner to rethink the entire way they sold all these diverse products and services, and how that would be served by their dotcom. We began by conducting stakeholder interviews and an extensive content audit of their existing offerings to find more intuitive ways of organizing the new web presence. From there we took four disparate sites and put them under one brand umbrella, optimized to service the needs of each target audience. We first created more transparent logic for how users move through the site by improving discoverability through structure and hierarchy to allow users to find, browse and scan pages effortlessly. We let users filter their experience by industry or company size, to better align them with products that service their needs. We also moved from opaque jargon to clear and succinct benefit-driven communications, and added context driven CTAs filtered to appropriate call centers based on specific industries and product queries. We built a site prototype and tested our strategic approach and designs against real consumer behavior, conducting five user tests with over sixty individuals. We were able to identify actionable feedback and optimizations that we directly applied to our developing designs to improve website conversion performance. We also brought the brand’s maverick persona to life—in look, feel, tone and experience. 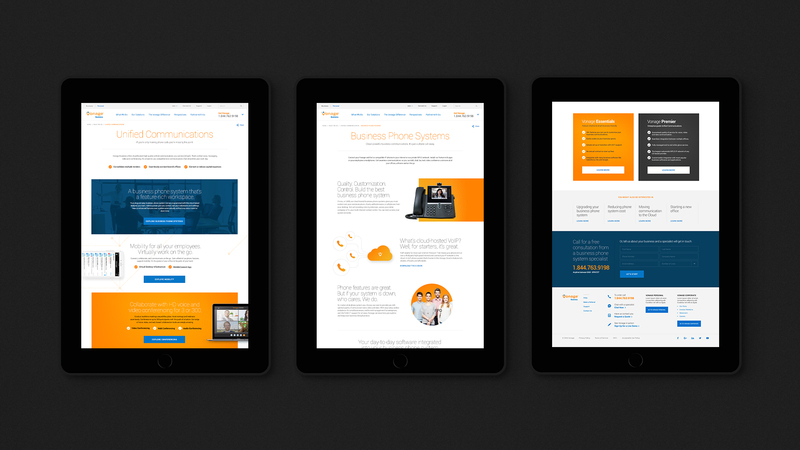 The look and feel included an updated icon library, as well as new illustrations that helped contextualize the benefit of Vonage’s more complex products and services. Leveraging their core brand voice, we created a manner of speaking for digital that was fun, concise and benefit-driven—while still remaining SEO friendly. We audited every piece of content to serve up quality over quantity—only selecting benefit-led content that provided reassurance around Vonage’s reputation, reliability and performance. We then rewrote every piece of copy to be clear, transparent and easy to understand—using this newly established brand persona and tone of voice. 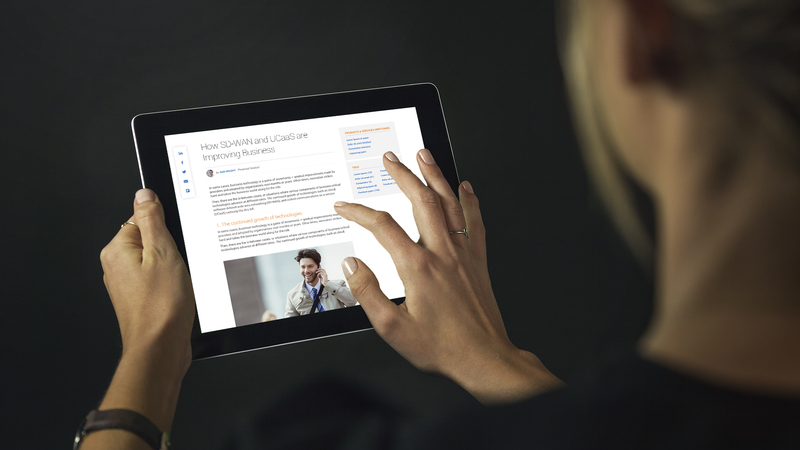 To help further solidify their position as a thought leader in the cloud communications industry, we also created an intuitive content hub within the new site that gave Vonage a space to build on their relationships with customers in more meaningful ways. 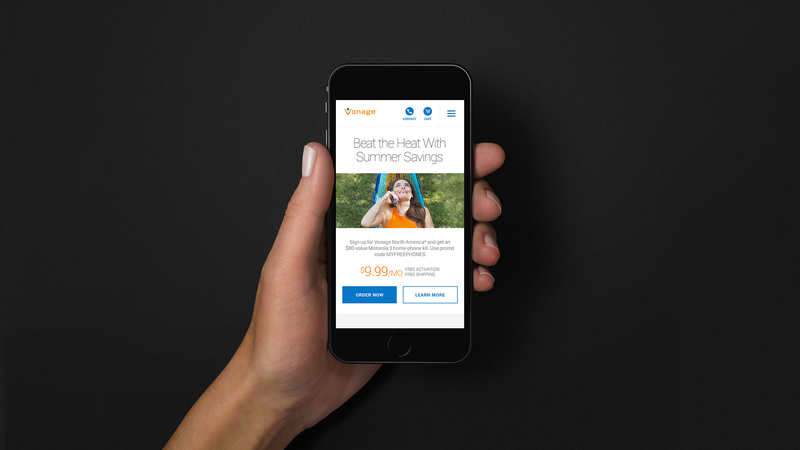 We reimagined Vonage’s digital consumer journey to create one unified experience that humanizes their product offerings for each distinct audience through UX architecture, brand messaging and content. We also armed them with a modular architecture that could keep up with their rapid innovation for years to come.